In India, the birthplace of Buddhism, buildings that house a statue of Buddha are called Garan. Within the seven most important buildings in a temple, which are called ‘The Seven Garans’ a ritual bathhouse is always included. The tradition of cleansing the body, also resulting in the cleansing of the spirit, was a fundamental idea underlying early Indian tradition. 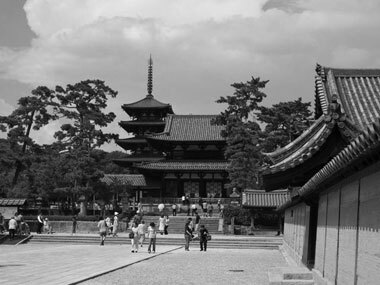 In the Daito Seiiki Diary by Genjo Sanzo（602-664CE）, it is stated that the ritual bath in the Chinese Buddhist temple was open to the public. It housed medicines and food in order to aid both the poor and the sick. In Japan, all Buddhist temples had a ritual bath building called the ‘Yuya’. Beginning in the Nara period, Garans became more common in Japan and always included a ritual bathhouse. Gradually with the increase in the number of ritual bathhouses, their size also increased and they began to be known as ‘Ohyuya’, ‘Big Bathhouse’. This bath, according to original Buddhist thought, was intended only for the priesthood. However, there are stories that the wife of the Emperor Shomu, Koumyou Kougou (701 － 760 CE) allowed the sick the opportunity to bathe six times every month and even personally washed them. From the Kamakura period (1185 － 1333), people other than the sick also were allowed to enter the baths. 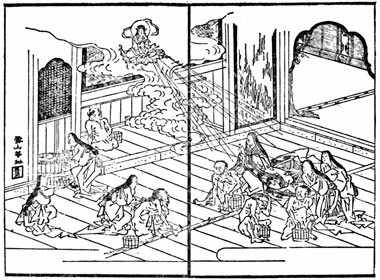 In the Kansai region, Kouboudaishi (774 － 835) conceived the ‘Mushiburo’ steam bath. These were originally made in a cave where straw mats were doused in seawater and then placed over hot coals. Eventually, the mushiburo steam bath spread throughout Japan, becoming popular among the general population. Also around this time noblemen began to construct their own private baths in their homes, which triggered the idea of public baths open to the general public. This signaled the beginning of the tradition of bathing amongst the general population.